Raspberry Pi 3 Model B+ launched with 1.4GHz processor and 300Mbps Ethernet. 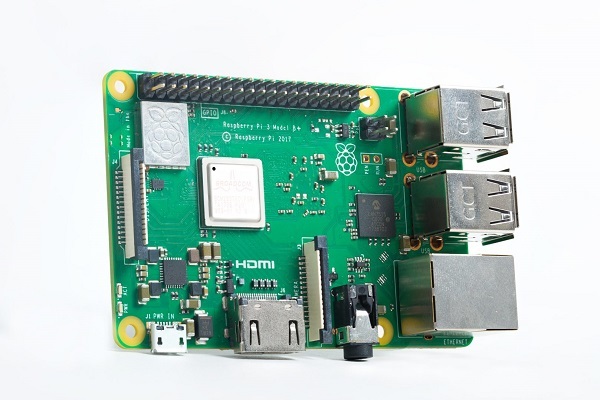 Just over two years ago, Raspberry released Pi 3 Model B, its first 64-bit product, and first product to feature integrated wireless connectivity. Now the Raspberry Pi 3 received the "plus" treatment. It comes with 1.4GHz 64-bit quad-core processor, dual-band wireless LAN, Bluetooth 4.2/BLE, faster Ethernet, and Power-over-Ethernet support (with separate PoE HAT). The new product is built around BCM2837B0, an updated version of the 64-bit Broadcom application processor used in Raspberry Pi 3B, which incorporates power integrity optimisations, and a heat spreader. Together these allow us to reach higher clock frequencies (or to run at lower voltages to reduce power consumption), and to more accurately monitor and control the temperature of the chip. Dual-band wireless LAN and Bluetooth are provided by the Cypress CYW43455 "combo" chip, connected to a Proant PCB antenna similar to the one used on Raspberry Pi Zero W. Compared to its predecessor, Raspberry Pi 3B+ delivers somewhat better performance in the 2.4GHz band, and far better performance in the 5GHz band. The wireless circuitry is encapsulated under a metal shield, rather fetchingly embossed with Raspberry logo. This has allowed Raspberry to certify the entire board as a radio module under FCC rules, which in turn will significantly reduce the cost of conformance testing Raspberry Pi-based products. The Pi 3 Model B+ use a magjack that supports Power over Ethernet (PoE), and bring the relevant signals to a new 4-pin header. Raspberry will shortly launch a PoE HAT which can generate the 5V necessary to power the Raspberry Pi from the 48V PoE supply. The improved power integrity of the BCM2837B0 package, and the improved regulation accuracy of new MaxLinear MxL7704 power management IC, have allowed Raspberry to tune its clocking and voltage rules for both better peak performance and longer-duration sustained performance. Below 70°C, it use the improvements to increase the core frequency to 1.4GHz. Above 70°C, it drop to 1.2GHz, and use the improvements to decrease the core voltage, increasing the period of time before we reach our 80°C thermal throttle; the reduction in power consumption is such that many use cases will never reach the throttle. Like a modern smartphone, Raspberry treat the thermal mass of the device as a resource, to be spent carefully with the goal of optimising user experience. Note that Raspberry Pi 3B+ does consume substantially more power than its predecessor. Raspberry strongly encourage you to use a high-quality 2.5A power supply, such as the official Raspberry Pi Universal Power Supply. The Raspberry Pi 3 Model B+ is now on sale for $35 (the same price as the existing Raspberry Pi 3 Model B).